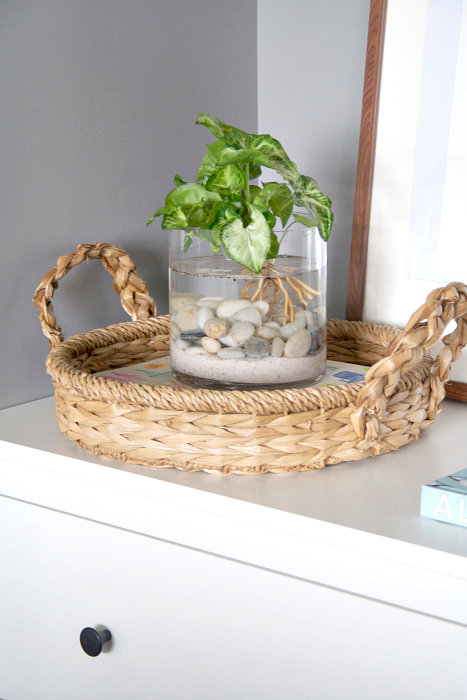 elliven studio: #DIY Water Plant and Family Room Sneak Peek! If you're following me on instagram or twitter, than you have already seen a few sneak peeks of the family room progress. This room has definitely been troublesome for me. I've had so many different plans for it and none of them ever stuck. And you know what....thank goodness for that! If you told me that in the end, the tv would be on the long wall, I wouldn't have believed you. I did not see this coming. Anyhow, long story short...the plan is in place, the plan is fabulous and I'm one happy camper! I'm super excited to have this room so close to being done. That's correct, it's almost done. The huge pieces to the puzzle were picked up last week. Two dressers from Ikea, which are now flanking the fireplace. Oh goodness, I loooooove it! So of course, the next step is styling the tops of these glorious, oh so perfect, made just for this space, dressers. 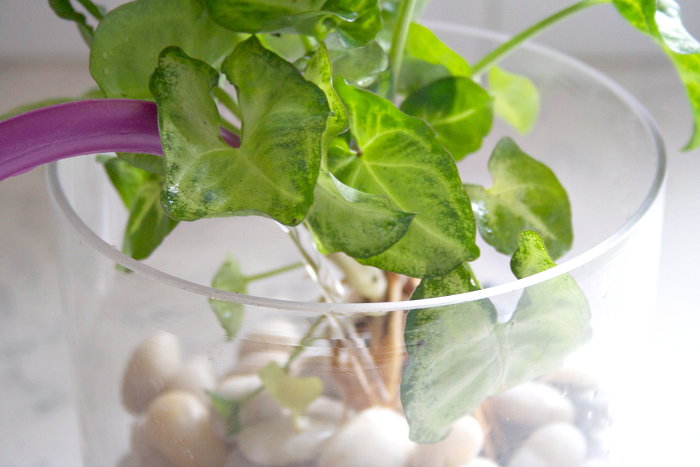 I thought that this would be the perfect opportunity to try making a water plant arrangement. Lindsay and Holly got me hooked when they did this with their tulip & paper white bulbs in the spring. So, I picked up a cheapo-weapo money plant from Walmart and dug out the decorative rocks and sand that I've had stashed away forever. (I'm going to throw a disclaimer out there. I have no clue if this is the way you're supposed to make a water plant, I'm just going for it and hoping it all works out. So please do keep that in mind if you give it a go). Okay...on with the show. 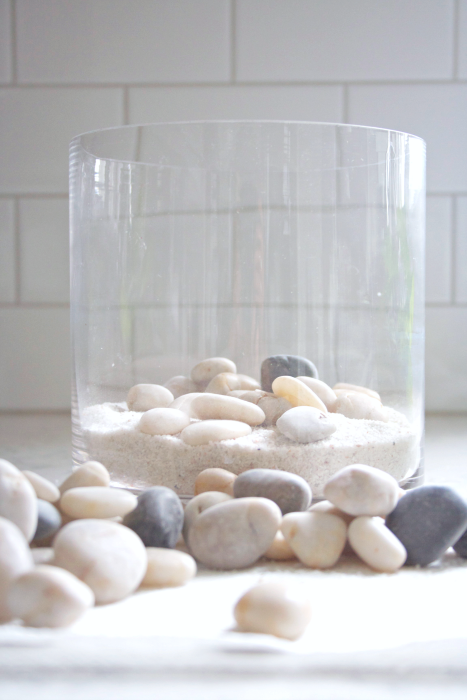 The pieces to the puzzle: rocks, sand, plant and glass vase/container to put them in. 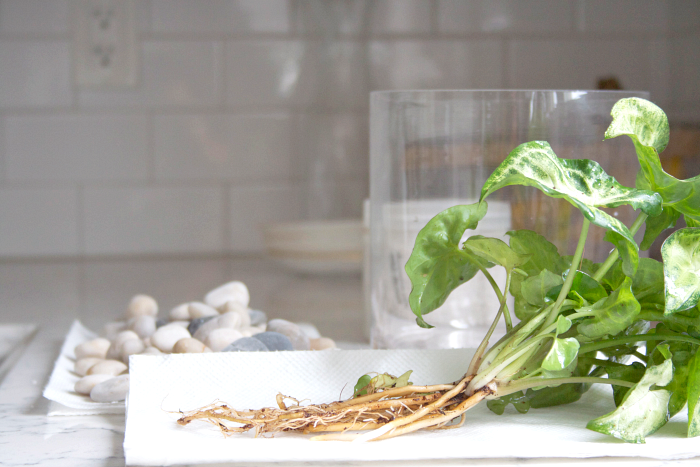 You'll need to remove all of the dirt from the roots. Be gentle, those roots are pretty delicate. 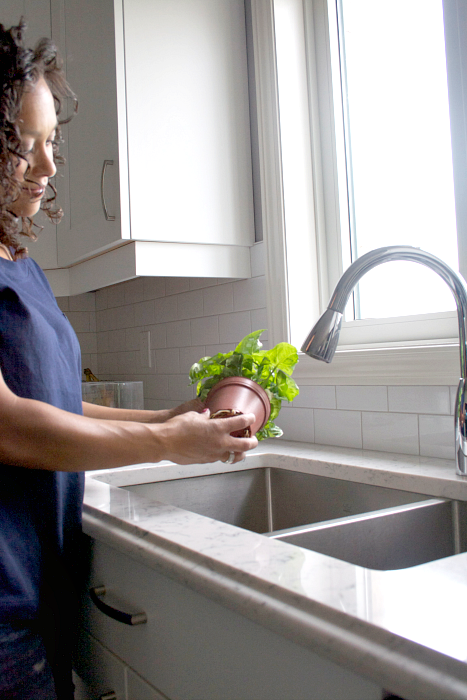 I placed a bowl in the sink to catch all of the dirt. 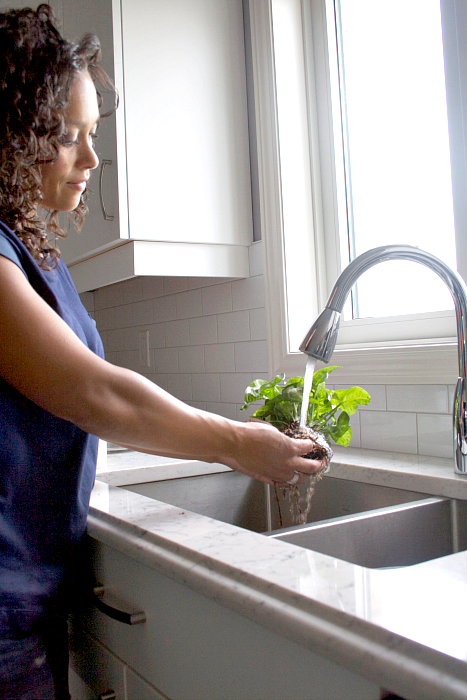 After rinsing the roots under the tap, I placed the plant in a bowl full of water to wash off the rest of the dirt. 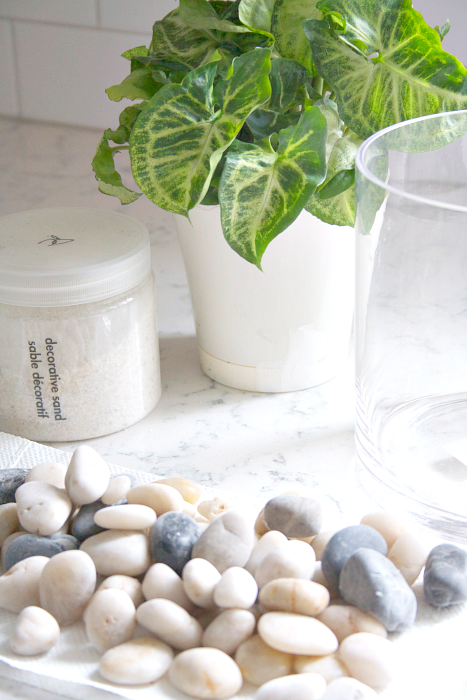 I thought adding sand would help fill up the vase a bit, I think I used a little too much, but I can always remove a bit when I go to change the water. 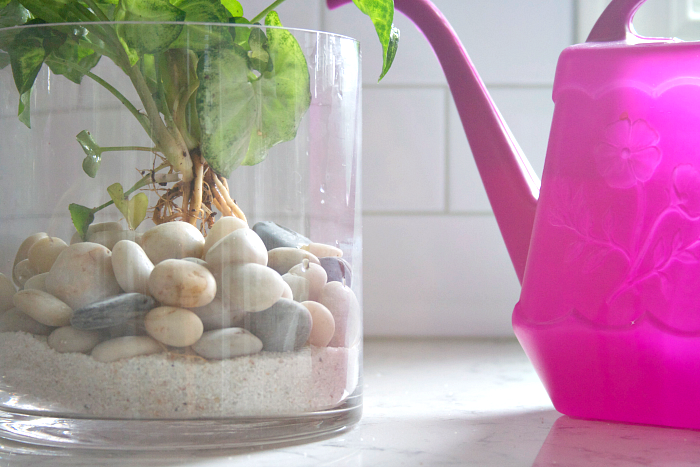 I gently placed the plant on top of the rocks and I did spread the roots out and also positioned a few below the rocks to help stabilize it a bit (not sure if that's a good idea or not and yes, I most definitely do have a pink watering can!). 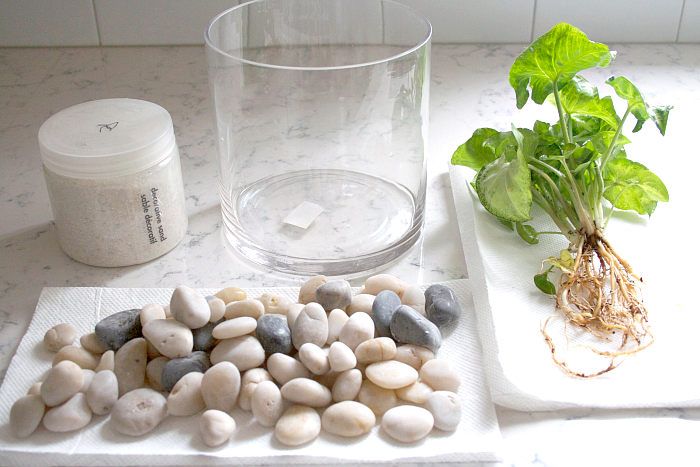 Slowly add some water so that you don't disturb the sand or plant too much. And here it is all done and in it's place. Now, I'd looooove to show you more of the dressers and this corner, but I won't for two reasons. 1- I want to save it for the family room reveal post and 2- it's still not finished (notice the art, I still need to buy a new mat and hang it up. I promise I will show you the full deal soon. 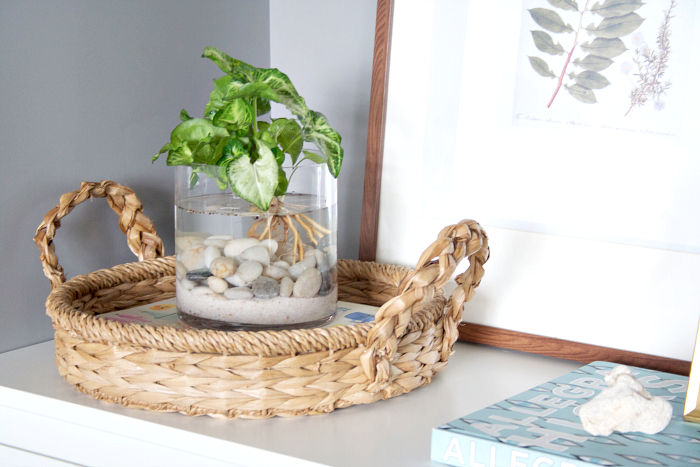 I love how light and airy this feels vs placing the plant in a pot. Turns out that there were three different plants in the one I bought, I discovered this once I started washing the dirt away. So you could make more than just one. I chose to keep the other two in a pot and placed them in the kitchen. nice diy! thanks! looks pretty! Looks great! Thanks for sharing you idea! Looks great! 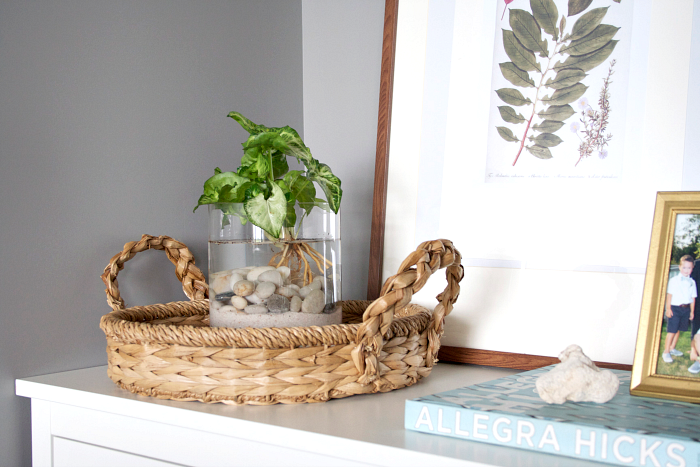 Love the mix of textures, perfectly styled with that raffia basket...casual cool! I can not wait to see the big reveal of your family room! I have brown leather furniture at home and I can never figure out how to decorate around it!